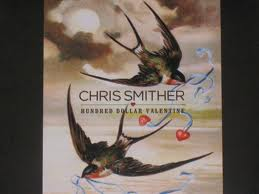 Veteran folk-blues singer-songwriter Chris Smither has endured a roller coaster 40 year recording career and his recently released 12th studio album 'Hundred Dollar Valentine' suggest that this 67 year old is in fine fettle and currently experiencing a high. The peaks of his musical associations with Bonnie Raitt, Emmylou Harris and Diana Krall have been interspersed with fallow periods where the drink took hold. This has probably held Chris back from widening his exposure but he remains a highly respected figure within the industry. This eleven track collection of original recordings, the first of Smither's career, meanders along a roots-infested path creating a vision of a solitary figure strumming his way through life regardless of whether anybody is listening. Yet those who take time out can immerse themselves into the hazy atmosphere created by the sound which induces a state of reverie and take a relaxing break from the hectic real world. The album starts with a jaunty little number possessing the record's title track, before opening out to combine a selection of slow bluesy songs such as 'What It Might Have Been' and 'I Feel the Same' with the clever inclusion of more up-tempo numbers that take the album in an alternative direction. Possibly the finest song on the album, track four 'What They Say' wakes the record up from its slumber with a fiddle inspired beat complementing the ever present harmonica and acoustic guitar A few tracks later the sound is repeated with an upbeat blues tinged number 'Make Room For Me' that you could envisage originating in 50's juke joint. Throughout the album, Smither's gruff, effortless, laid back vocals give the record that extra rootsy feel and although he cut his cloth in the folk clubs of New England, the sound is very similar to Malcolm Holcombe who specialises in creating the imagery of his native backwoods North Carolina. The comparisons with Holcombe, who frequently visits the UK, increase with the final track when Smither delivers an uncut version of one of his older songs 'Rosalie' with the, intentional or not, sound affect rocking chair at the end giving an impression of front porch blues. This triggers memories of Holcombe continually rocking on a wooden chair while performing at the Kitchen Garden Cafe in Birmingham a few years ago. There is a place for this album when you feel like drifting away and perhaps absorbing a little bit of melancholy but be prepared just as you fall under its spell; Smither has that knack of injecting some life back into you. Just like a lot of roots albums, it would be enormously benefited by a live experience as well.